It weaves together the stories and the destiny of the farmer and the many people involved in the seven subsequent production stages (ginning/cleaning, carding/slivers, warping, weaving, dyeing, and printing). Khadi generates community-based livelihood and strengthens the village economy. It is a wonder fabric with less twist and softer weave (more air cavities, more porous) that is uniquely thermally efficient. Mahatma Gandhi urged the adoption of khadi as a means to economic freedom. Modern day sustainable production practices, low carbon footprint urging, and the importance of reducing the use of chemicals in everyday life, find new resonance in the production of organic khadi. Built on Gandhian vision, and with a strong legacy connect to his personal involvement, this is an enterprise that is uniquely progressive in its holistic approach to community development, combining traditional skills from across regions, current scientific advances, design expertise, and a pulse of changing fashion trends of individual and commercial customers. In 1936, Gandhi moved to Sevagram, then a village near Wardha. This is where he set up his base. (Today, the ashram in Sevagram attracts visitors from around the world who walk in quite awe through a campus with humble cottages that were once occupied by people who shaped the destiny of the country. Prayers are conducted at specific times through the day). In 1938 Gandhi inaugurated the Magan Sangrahalaya (museum), dedicated to rural enterprise. Arguably, this is the only facility he conceptualised himself, and got to see in its early operational days. The governing body today works with over 400 self-help groups providing training and skills development, sharing new production techniques, nurturing local handicrafts and artisan communities, and spreading the reach of khadi, from farm to fabric. Chairperson, Dr. Vibha Gupta leads the diverse projects of a resurgent Magan Sangrahalaya Samiti’s rural enterprise that ensures livelihoods in the region through skill development. 80% of sale proceeds from a wide variety of products from khadi fabric and finished garments, to personal products and staples, toys, food products and more, are ploughed back into the betterment of the lives of all those involved in their production. Magan Khadi shares a symbiotic relationship with the Magan Sangrahalaya Samiti’s rural enterprise khadi projects. The focused Magan Khadi enterprise and brand will help build on considerable current achievements and scale growth plans to further community development objectives. In 2016, Magan Khadi procured 16 T of raw organic cotton from 25 farmers of Samudrapur, Seloo block, Wardha, and Arvi block of Wardha District. The Khadi unit works with two Organic Farmers Training Centres – Chetna-Vikas (Alodi village) and Magan Sangrahalaya Samiti (Samudrapur, Girad village). Training is provided in – land preparation; mulching ; irrigation; sowing; multiple cropping; nutrient mix; pest control ; organic farming norms. A 12-member team monitors the organic farms, keeps records, maintains an organic seeds bank, supplies organic farm inputs, assists in marketing farm produce, and conducts farmer training. With Mission Samriddhi intervention the annual production target is 37T of organic raw cotton. Earlier, the carding/sliver/roving process stages were outsourced. Owned ginning and roving machines will now be installed at a nodal centre near the organic farms for increased efficiency and less wastage. Soft baling machines will be used to prevent damage to micro cotton fibres. Spinning units will continue to operate in clusters (20 in Karla ; 35 solar spinning units in Seloo ; and 25 solar spinning units in the Magan campus in Wardha). The warping process which was earlier left to the weavers will be done in-house to ensure no mixing of non-organic yarn, which is essential to maintaining the integrity of the 100% organic Magan Khadi proposition. The number of farmers involved in organic cotton cultivation will increase from 25 to 60. Current production capacity will increase three-fold. Direct employment through process stages will increase from 173 to 261. And Magan Khadi will now be able to take up orders that had to be declined earlier due to capacity constraints. 4. Eco Prints – Dry flowers, leaves, roots and bark are placed on the fabric and the fabric is rolled and steamed. 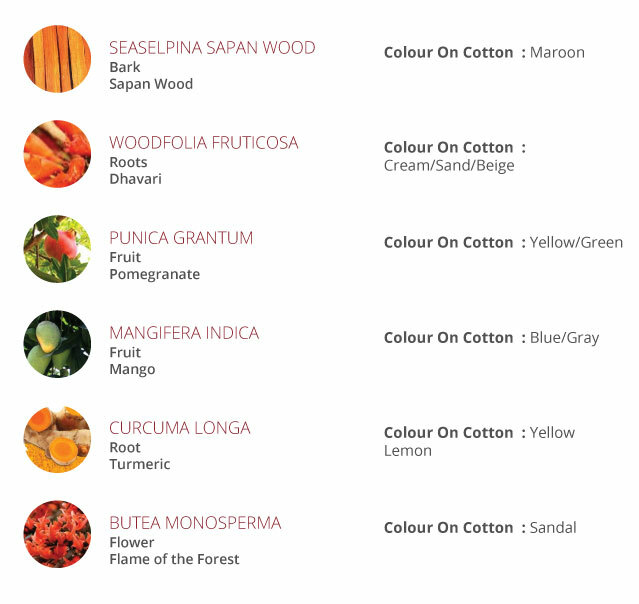 Natural dyes extracted from seeds, roots, leaves, vegetables, fruit, flowers, herbs and barks create the entire pantone range of colours. 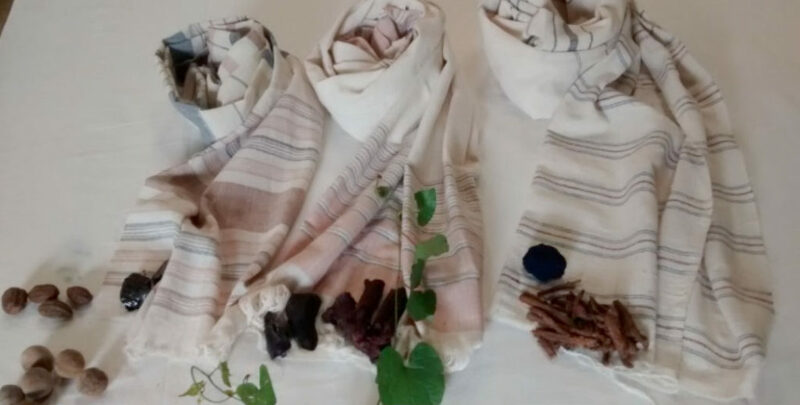 The often edible and known for medicinal properties in traditional medicine, natural ingredients produce the most vivid shades and delicate pastels in the hands of Magan Khadi experts working with well researched and documented organic dyeing processes. 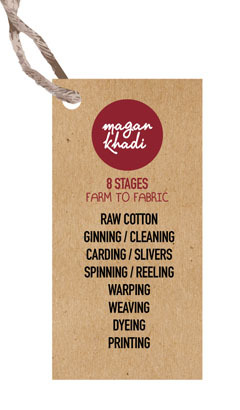 In addition to retail customers, Magan Khadi also caters to the needs of institutional buyers including reputed brands like Aditya Birla, Good Earth and Navdanya (finished fabric with custom design printing and stoles) and national khadi institutions. Magan Khadi is not merely about designing exquisite fabrics and prints in khadi. We can play a very significant role in improving the well-being of so many rural communities across India. Organic khadi has implications on the health and prosperity of our farmers, weavers, and all those involved in production. Organic means no chemicals through the process stages – from farm to fabric. Very few people understand this implication of this and the reality of what Magan Khadi is doing. After decades in this field and with all our pioneering work, we’re still at the beginning. With the support of Mission Samriddhi , I am looking at interventions across process stages to realise our true potential. Popular Warli prints from Warli tribe (Dahanu, Thane dist.) of Maharashtra. 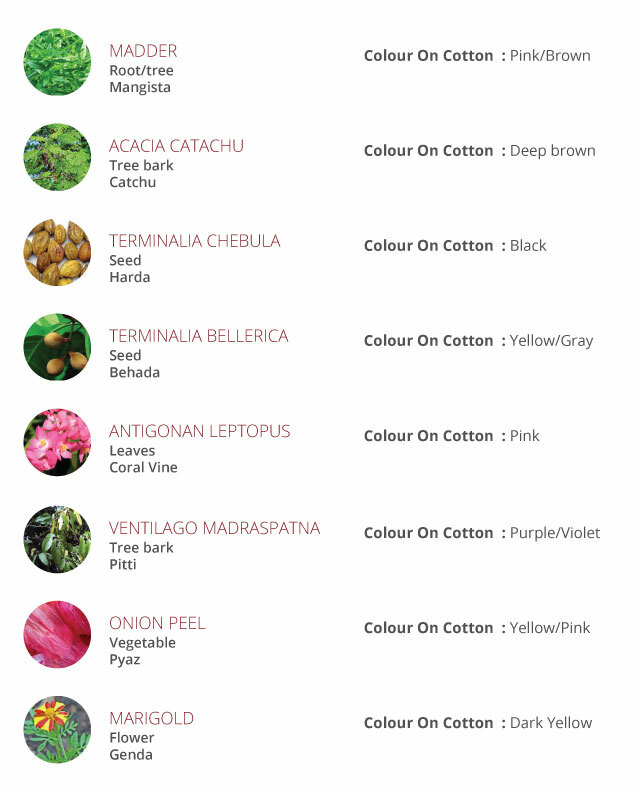 28 design patterns in 20 colours. The Khadi (a hand-woven and hand-spun cotton cloth) sector is supported by the Government by providing rebate on the sale of Khadi. Magan Sangrahalaya took up the production and sale of Khadi as a mission to support the dying weavers and spinners and sell the eco-friendly cloth to the people without taking any Government subsidy. Presently, this self-reliant Khadi unit of MSS is providing employment to 150 artisans including sliver plant workers, spinners, weavers, tailors, dyers and sales persons. With the collective effort of MSS team and artisans, the institute annually sells 50 Lakh Rupees worth of Khadi. To increase the productivity and earnings of thick-yarn weavers using traditional Charkha, MSS developed a Four-spindle Magana Charkha, an improvised spinning wheel. The critical intervention here is the replacement of the costly multi-national ‘Toparm’ by an indigenous ‘Toparm’, which can be easily fabricated and repaired in any village workshop. With this appropriate device, the spinner can earn and produce four times more than before. MSS is manufacturing ‘Organic Khadi’, utilizing the organic cotton from organic farmers of CAPART-sponsored Watershed Project villages. Using the high-tech, decentralized, sliver plant developed by Dastakar, Andhra Pradesh, MSS is producing the best quality eco-friendly organic sliver. At the same time, it is also recycling the organic cotton seeds back to the farmer since the process keeps the seeds intact.